Krill has a low content of ash making ideal for fresh water feeds. It is lower in content of phosphorus than other marine based meals such as shrimp or fish meal. Its calcium/phosphorus ratio is near to 1,5:1 which favors the absorption of both minerals, and it is significantly lower compared to fish or crustacean meals (3 or 4:1). Krill is also a rich source of bioavailable minerals. Minerals are nutrients that perform essential biological functions, both as enzymatic cofactors and as regulators of the immune system. The degree of bioavailability of minerals will have a significant effect on the physiological and immunological fitness of the animal. Organic minerals are more bioavailable than inorganic ones, since the first are chelated with amino acids, peptides or proteins that avoid antagonims in their active transport. Of all the minerals present in krill, some deserve special mention. Copper, which in krill is concentrated at a rate ten times higher than in fish meal, is found chelated with resides of lysine and has an important role in the formation of collagen and in the integrity of fin and skin. Selenium, which is also more highly concentrated in krill than in fish meal, is an important player in the cellular antioxidant systems (glutathione system). Copyright � 2002-2010 Krill Canada Corporation. All rights reserved. Shows in the case of catfish that the net absorption of chelated minerals (copper proteinates, iron, manganesum, selenium, and zinc) is higher than that non-chelated forms (sulfates and selenates). The effect of dietary modification on fin quality of Erwin strain rainbow trout. Barrows and Lellis. Review for U.S. fish and Wildlife Service, Bozeman fish Technology Center. One of the most common failures in farmed fish is the low quality of fins. Barrows and his associates have been the first to demonstrate the relevance of feed quality in skin integrity. They have shown that the minerals in krill have a positive effect in the prevention of erosion in the fins of Trout. They suggest that the cause of this effect lies in the copper content in the krill, since this mineral is essential on the performance of enzymes specialized in the cross linking of collagen. Unlike mineral premixes are normally supplemented to feed where copper is added in the form of copper sulfate, copper in krill would be highly bioavaliable. Both fish and crustaceans live in an immersed aquatic environment, where their chemioperceptive system receives permanent stimulation by soluble compounds. These substances are usually of low molecular weight, non-volatile and most of them contain nitrogen (amino acids, nucleotides, etc.). These compounds stimulate the chemioperception of the animal (taste and smell), and its behavior (feeding behavior and intake). Krill is a natural bait for many species of fish and crustacean, for example, it is one of the main sources of food of wild salmon. Thanks to a low temperature production process, krill preserves all of its properties and it is being used in the aquaculture of salmon, shrimp, sea bream and yellow tail. To provide higher palatability to the commercial feeds, to mask antibiotic taste, and to provide better acceptability to less palatant cost effective diets. The feature of palatability in krill has been found to rest in the presence of certain amino acids that stimulate the smell and taste, and in the existence of glycogenic amino acids that are appetite stimulants. Furthermore, krill also features other substances of low molecular weight that are reported to have similar effects as palatants, such as TMAO (Trimethyl amine Oxide). Proves that the feeding behavior of several species (sea bream, Japanese eels, black sea breams, and yellow tail) are stimulated when krill is added to the feed. 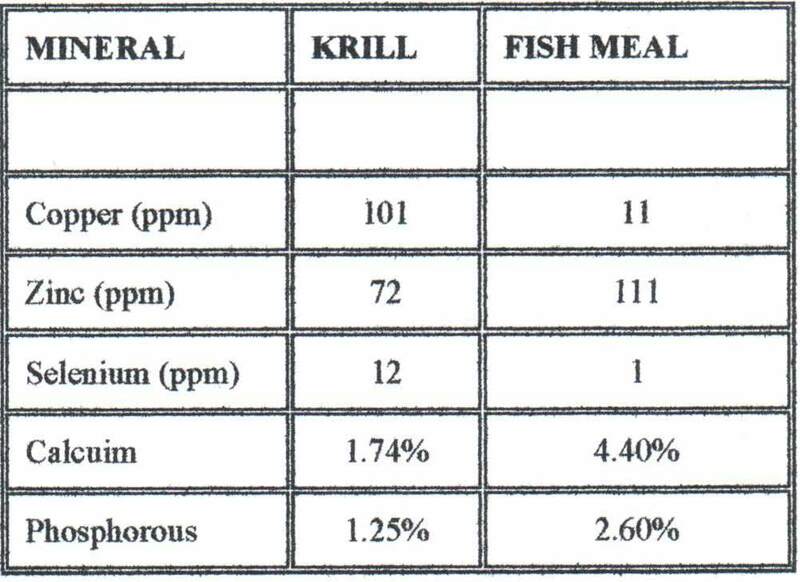 Through the use of electrophysiological tests it proves that krill extracts stimulate the smell response of sea bream. It was also found that the non protein of the krill contains smell and taste stimulants, and specific amino acids were identified which probably were responsible for this effect. It shows that P. Vannamei has a strong preference for feed which includes krill. The study included the use of 16 ingredients usually incorporated in commercial feed for brood stock. Of all these ingredients, krill was only outperformed by artemia. Krill is a source of natural carotenoids. Over 95% of the pigments present in krill are in the form of asthaxantin, which is the only type of pigment that fixes onto the flesh of salmon when krill is used in the diet and the flesh color is the same that it is found in wild salmon (Hue). Pigments in krill are esterified giving them more stability. Asthaxantine is not only a pigment, but also functions as a photoprotector and antioxidant. Furthermore, it has been proved that asthaxantine has an effect in rates of growth and immunomodulation of both fish and shrimp. Finally, asthaxantine has been shown to positively influence survival rates in shrimp. Based on the popular Japanese belief that krill is a pigment source of yellow tail, the researchers studied the effect of krill oil (1000 ppm) on the pigmentation of yellow tail. In this species the typical flesh color (a green blue with a yellow line on the side) is given be different pigments (tunaxantin). The study proved that yellow tail transforms the asthaxantine in krill into tunaxatine. One of the most frequent uses of krill is in special diets, when salmonids are transferred from fresh to sea water. This is due to the osmoregulating properties of krill. Krill is rich in trimethylamine oxide (TMAO) which is a known osmoreguator. The high salt content of the environment represents a strong physiological challenge for fish and crustacean. They need to keep their hemodinamic and a proper physiological status. This is particularly important in salmonids in captivity which are transported from fresh to sea water in a very short span. Low molecular weight and quaternaries ammonia compounds such as trimethylamine (TMAO) are known osmoregulators. Chitin is component of several crustacean and insect carapace. It is an energy source for several species which can degrade chitin through special enzymes. Disease control, profilaxis and eradication are based on the use of vaccines and chemiotherapeutical substances. But there are a number of pathologies that have no known cure. There are for example, the case of Piscirichettsiosis in Chilean salmon industry and the disease that massively attack shrimp industries around the world, against which there is no known specific prevention or cure. One of the prophylactic alternatives available is the use of agents that stimulate the immunological system of the animal. Among these agents there are the complex polysaccharides such as chitosan. Chitosan is a derivative of chitin, which is found in krill. Chitosan has been found to be an immunostimulant in salmon and trout when administered as orally (in the feed) or injected. Krill is a source of chitin, which is now being tested as a stimulant of the immune system for several species. It reports a significant increase in the specific immunity of salmon and trout. It shows protection against furunculosis when chitosan is used in the diet. It shows that the fish mortality due to Aeromona salmonicida can be reduced by 50% when using injected chitosan or when it is applied in a bath by immersion. Effect of Growth Performance P. Vannamei. (1997). "The addition of krill in experimental diets has significantly increased the growth rate of shrimp," says P. Vannamei. Krill was added in the same proportion that fish meal was subtracted from the diet.